Rick Edmonds is media business analyst for the Poynter Institute where he has done research and writing for the last ten years. Since December 2007, his commentary on the industry appears in The Biz Blog on Poynter Online. He has also been co-author of the newspaper chapter in all seven editions of the Project for Excellence in Journalism’s State of the News Media report 2004 through 2010, and is working on the 2011 report. He is frequently quoted in articles on newspaper economic issues and new business models and has provided comment in the New York Times and on numerous NPR reports. 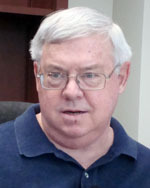 Edmonds spent 11 years with the St. Petersburg Times organization in various editor and publisher roles, including two years as managing editor of the paper’s Tampa edition. Earlier in his career, he was James Reston’s assistant at the New York Times and a reporter at the Philadelphia Inquirer where he was a finalist for the Pulitzer Prize in national reporting in 1982. Rick Edmonds, business analyst, The Poynter Institute, says the prediction newspaper advertisers would eventually move much of their advertising to newspaper websites, during the first decade of the 21st Century, has not been realized, and that digital revenues are averaging about 8-10 percent of gross revenues across the newspaper industry in 2011. Edmonds says the economic value of establishing pay-walls to require payment for access to newspaper websites is also still being debated across the industry.